We have had a large tub of sticky back foam shapes left over from the Beans birthday party. 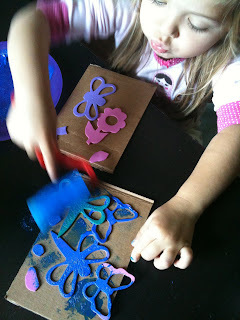 The other day we pulled them out and used them to make our own stamps. I cut up an old cardboard box into smaller squares and rectangles. 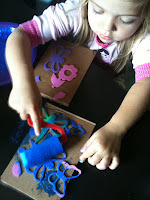 Then the Bee and I both chose some foam shapes and put them onto the cardboard pieces. I used mine to make patterns and the Bee did some cool overlapping with hers. 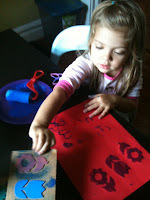 After we were done the Bee selected a few colors of paint which I poured into a plate for her. Then using a foam roller she rolled the paint onto her stamp, pressed it onto the paper and ta-da she had an awesome print! We only made 4 stamps the other day, so I am hoping we get a chance to make some more this week and do some more stamping. 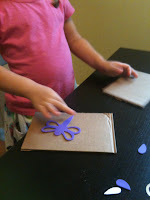 I like this idea - simple, inexpensive, and fun!